Celine Dion's 14-year-old son Rene-Charles made his mum proud at the funeral of his father Rene Angelil in Montreal, Canada on Friday (22Jan16) by delivering a heartfelt tribute and a promise to live up to his dad's standards. The teenager arrived at the Notre-Dame Basilica with his mother and twin brothers, Nelson and Eddy, and comforted Celine throughout the service, which was streamed online and telecast in Canada. The singer looked on proudly as Rene-Charles addressed the thousands of mourners first in French and then in English. He said, "Fifteen years is not a long time for a son to get to know his father." The teen then attempted to lighten the mood in the church as he talked about sharing his late dad's passion for golf, poker and "smoked meats". "You left me now with enough good memories of you to share with my younger brothers," he added. "I'll make sure to pass on what I've learned from you. "You are a tough act to follow... but I promise you here that we're all going to live up to your standards." His speech drew applause from the masses, as he returned to sit next to his mother. 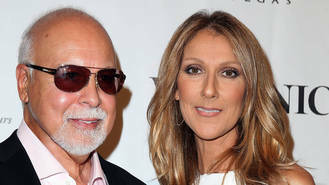 The boy's father, Rene Angelil, lost his battle with cancer last week (14Jan16), aged 73. The location of the funeral, held a day after hundreds of fans paid their last respects to Rene during a memorial at the same church, was a special place for the family - it was the setting for Rene and Celine's wedding and Rene-Charles was baptised there.